We don’t call this site Colour Me Classic for nothing. I like to experiment around with different styles but essentially I just always come back to my Colorful classic pieces and prints. This structured style purse never gets old to me. It was a great vintage find a few years back. I think this outfit would also be acceptable for work, a baby shower or luncheon. Is luncheon still a word of has this been replaced by brunch? Beats me. After working all those years at Best Buy I can’t help but want to mix blue and yellow together. This time around I decided to add some polka dots and coral to kick it up a notch. 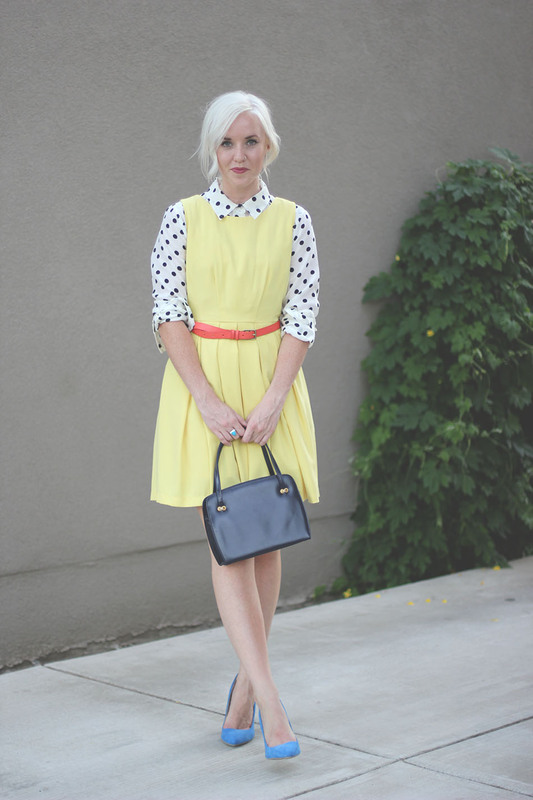 This is a fun way to transition your Summer dresses into the cooler months. Add your favorite printed button up under a tank style dress and suddently it feels brand new! I love this layered look! I always struggle with transitioning a summer sleeveless dress to fall! fun look! i love those pumps! I love layering dresses! It’s a great way to transition a look from summer to fall!! I love that you partnered this look with so much color. You look adorable! Very classy! Love the powder blue heels! Totally agree with you, it’s so fun to play with clothes and make it more unique! Love the whole bunch of colors you’ve added to the outfit. I never thought to layer dresses like that!! What a fun idea! You look so cute! I am now following you on Twitter, follow me back? I have yet to try this, but I NEED to! It looks greats on you.